Anglo Pacific is an unmatched provider of shipping to Taiwan services. With 35 years of practice under our belts, energetic staff and a reel of excellent customer reviews, it is no surprise that year after year, people turn to us for sending personal and household goods to Taiwan from the UK. If you are travelling overseas and you have packed too heavy, you want to send a gift to a friend in Taiwan, or if you are emigrating and need a cheap and easy way to ship your furniture to Taiwan, Anglo Pacific’s UK to Taiwan shipping solutions are the answer regardless of the size of your load. For over three decades our services have been tweaked, transformed and more recently, taken online to ensure that we provide an ethical, punctual and convenient service every time we ship to Taiwan. We send 20,000 consignments annually and many of these are shipping from the UK to Taiwan. But the one thing they all have in common? They all begin with a remote video home survey. After this, you will be assigned an Taiwan shipping coordinator who will steer you through the move, provide detailed quotes and draft your shipping to Taiwan plan that accommodates your load, time-frame and budget. Why Choose Anglo Pacific as your UK Shipping Company to Taiwan? We take care of your items on their entire journey to Taiwan. We start by expertly packing your possessions using strong packing materials or moving boxes, and we only allow competent staff to handle your load at all points. We also create a clear and fully organised moving plan to minimise the prospect of theft, damage and loss. Moving to Taiwan is an exciting time so the logistics of shipping suitcases to Taiwan should be the last thing on your mind. Using Anglo as your shipping company to Taiwan from the UK will free up the time to focus on the fun aspects of your move, while we coordinate your door-to-door Taiwan shipping. Many UK to Taiwan moving companies use a one-size-fits-all approach to make life easy for them, but we know this isn’t possible if you want to provide customers with a premium service. We tailor all moves to suit the exact requirements of our customers, always making sure they leave happy and satisfied with our shipping service. 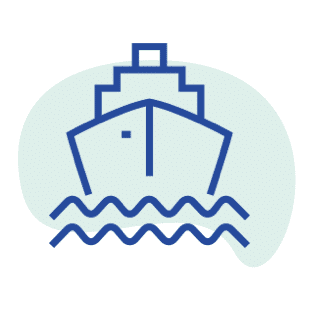 Whether you want to save money or a speedy delivery, our access to sea freight and air freight vessels means we can cater to any specification. If you want your household and personal items to reach Taiwan urgently, enquire about our air freight to Taiwan delivery service. We are proud members of the British Association of Removers (BAR) and we are a FIDI Accredited International Mover, both for our reliable and dependable shipping to Taiwan solutions. We are also bound by the BAR Advance Payment Guarantee Scheme for our customer’s financial protection. All of our Taiwan shipping quotes are free and come with no obligations. All of the minor details are included from the get-go to ensure that you are not hit with hidden fees down the line. Book your free home survey today and a specialist team member will assess your consignment and provide you with detailed shipping to Taiwan estimate. What can I ship to Taiwan from the UK? Relocating to Taiwan shouldn’t mean sacrificing the things you love the most, whether that is your clothes, furniture or even your favourite British foods. As one of the of the UK’s front-running shipping companies to Taiwan, we can send a suitcase, a whole home load, a car and beyond. You can even think of us as your own personal courier to Taiwan from the UK if you want to send just one box of treats to a relative living overseas. Just like any country, Taiwan has its own list of restricted and prohibited items that you won’t be able to ship to Taiwan, but if Taiwan border control allows it, we ship it! Your Taiwan shipping coordinator will provide you with an exhaustive list of items that you can send to Taiwan with Anglo Pacific, or if you have any specific shipping queries, just ask! Are there Different Transport Methods to Ship from the UK to Taiwan? Some shipping companies to Taiwan offer a one-size-fits-all plan, but our experts know that this doesn’t work! We provide a completely unique experience to every customer when shipping to Taiwan from the UK, but we employ this policy across all of our services. We have three shipping methods to use when shipping stuff to Taiwan; sea freight, air freight and road freight. Each method – or a combination of – is beneficial to different customer requirements. If you are looking for cheap shipping to Taiwan, sea freight is your go-to option! Sea freight’s economic costs make it the most popular method of transport among our customers. Your items are arranged onto a shared or sole-use shipping container, which is loaded onto our cargo ship to Taiwan for delivery. Sea freight is the slowest of our transport methods and you can expect your items to arrive within weeks for the UK to Taiwan shipping. For example, the average delivery time for air freight is 7 to 10 days, in contrast to the estimated 6 to 8 weeks for sea freight, but this is reflected in the bargain cost of shipping to Taiwan. Air freight to Taiwan is the most expensive of our transport methods; however, it is the quickest and sometimes the most convenient way to send goods to Taiwan. We pack your possessions onto a commercial air carrier ready for take-off to your chosen airport in Taiwan. Air freight is the best transportation to Taiwan method if you need your items sending in a hurry as your consignment will reach you in a matter of days. This timeliness does come with a much higher price tag than shipping to Taiwan using sea freight. Road freight is our bonus method that cannot be used alone except for UK deliveries. Road freight is an accompaniment service for our sea and air freight deliveries. It is frequently used when a customer lives far away from our UK port or depots, or when customers require home delivery of their cargo in Taiwan. How do you calculate the Cost of Shipping to Taiwan? Our services for shipping items to Taiwan are adjusted to suit your budget and time-frame, but there are three principal factors that will influence your overall shipping costs to Taiwan from the UK; load size, transport method and end destination in Taiwan. If you are looking for cheap shipping to Taiwan, sea freight is the recommended method as shipping costs from the UK to Taiwan are primarily estimated based on the dimensions of your load. By assessing your load via our online home survey, we can determine if you require LCL or FCL container shipping to Taiwan. If you choose Less Container Load, your items are loaded onto a shared shipping container alongside other Anglo Pacific customers’ and you will only be charged for space your goods consume within this container. Alternatively, it might be more advantageous for you to use Full Container Load, this is the assignment of a 20ft or 40ft container for your sole use and you will be charged a set rate based on which size shipping container you use. This is advantageous for very large loads, such as office removals, a whole home load and car shipping to Taiwan. If you send to Taiwan using air freight, expect to pay considerably more for this service as the bulk of your Taiwan shipping costs are calculated based on the WEIGHT of your items. With this being said, air freight is usually only used when a customer needs their items urgently and it is a small load, a box or two, or a suitcase, for example. Another contributing factor to the cost of shipping to Taiwan is the distance that your goods are travelling and how they are delivered upon arrival in Taiwan. What is Included in my Taiwan Shipping Quote? Shipping parcels, suitcases and household goods to Taiwan is already a stressful process and we don’t want to aggravate this by sneaking in any extra costs. Shipping from the UK to Taiwan is easy when you choose Anglo Pacific. We are committed, experienced and we complete successful shipments to Taiwan each and every time. Rather than just hearing what we have to say, see what our customers think in our Taiwan shipping reviews. To set the wheels in motion of your international shipping to Taiwan, book your video home survey today and one of our specialist estimators will review your consignment and provide you with the detailed UK to Taiwan shipping quote.